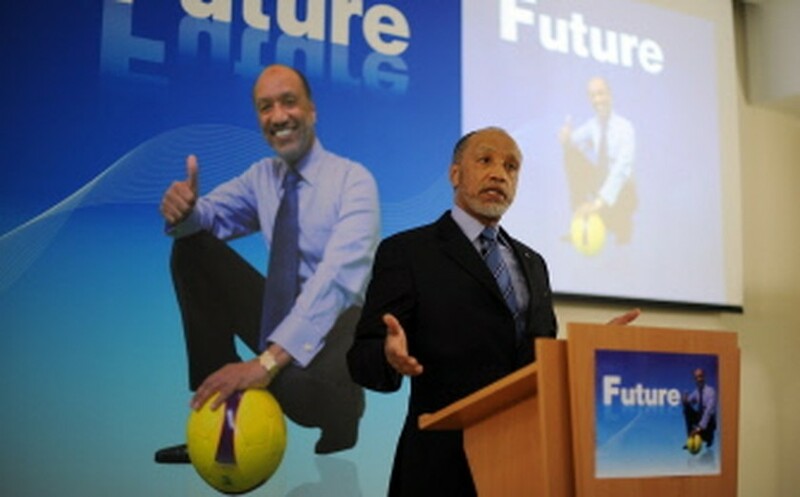 NICOSIA, May 25, 2011 (AFP) - FIFA presidential candidate Mohamed Bin Hammam has vowed to bring more transparency to football's world governing body amid fresh corruption claims before next month's leadership vote. FIFA has been beset by allegations of corruption in the run-up to the June 1 election, when Bin Hammam will challenge former ally Sepp Blatter, who is seeking a fourth and final four-year term. AFP file - In this file picture dated March 18, Mohamed Bin Hammam speaks at a press conference at AFC house in Kuala Lumpur. And Bin Hammam, currently president of the Asian Football Confederation (AFC), denied that FIFA was a corrupt organisation but one more in need of dynamic new leadership. "People want to see more transparency in FIFA which is accused of being corrupt whereas it isn't," said the 61-year-old Qatari, who was the inspiration for Qatar's stunning success in the race to host the 2022 World Cup. "What has been lacking has been this transparency which we haven't been able to get through to the public. That will be top of my priorities." Bin Hamman - who has had to constantly deny allegations of vote buying regarding the successful Qatar bid - said he was determined to restore pride in the world football body after years of stagnation under 75-year-old Blatter, who has served since 1998. "When Blatter took over FIFA he clearly made it known that he wouldn't do more than two terms, while in fact he is in his third and bidding for a fourth. "And to tell the truth FIFA has seen no real evolution during the last three or four years. He (Blatter) contributed a lot to the development of football but he's been there too long and it's time for new leadership of FIFA, change isn't a bad thing." Bin Hammam continued: "I don't consider myself the godfather of football but frankly I don't think things are advancing in FIFA. All we hear now are criticisms ... and that pushed me to put forward my candidature to bring about change. "I'm confident in my ability to restore FIFA's prestige. I'm 61-years-old and I have the ambition and the capacity to restore pride in FIFA. "Competition whether it be for the presidency or any other position is essential to assure the vitality of an organisation. The proof, once I presented my candidature Blatter began to propose new ideas which he wouldn't have done if there was no rival." Bin Hamman said he wanted clubs to have more of a say in FIFA and would also be proposing to almost double the number of executive committee members by giving four more seats to Europe, the same to Africa and Asia, three to the Concacaf, one to South America and another to Oceania, bringing the number to 40 from the present 24. A week ahead of the vote, Bin Hamman added: "I've enjoyed great support since I announced my candidature and I think I'm in a good position. I said when I launched my bid that my chances were 50/50 and I'll stick with that even if I'm confident."